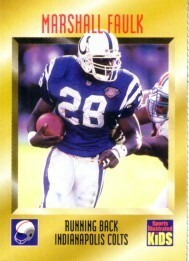 Hard to find 1995 Sports Illustrated for Kids card of former Indianapolis Colts superstar running back Marshall Faulk. Has typical perforations. ONLY ONE AVAILABLE FOR SALE.